26/10/2017: 8 babies, day 23 of the gestation period (9 born, 8 surviving). Bazooka is a force-of-nature rat - smart, persistant, and insistant! Thankfully she has calmed down compared to when she was a young kitten as she was impossible to contain. As an adult, Bazooka is still very busy and keen to explore everything, but she is also very settled in herself. 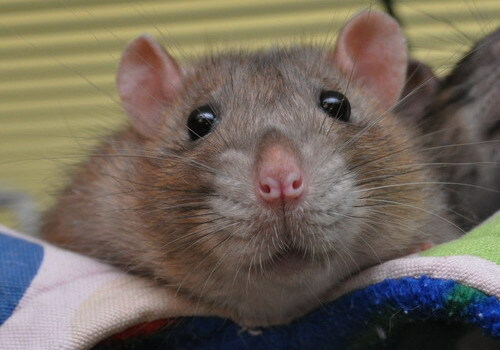 Severus is basically Bazooka's temperament-twin - his owner frequently refers to him as an evil genius, and Sev has destroyed more belongings and gotten himself into more pickles than most other rats ever get round to. He is a gorgeous effusive lad who is very accepting and accommodating, and people-oriented when he can spare the time. I'm not completely sure what possessed us to mate these two together, but it's probably part of their longterm game plan of taking over the world. We will likely get incredibly challenging agouti and black kittens with some freestyle markings. This litter will be homed jointly with the Alfrees and Batalox, and the closely related Biddys at Isamu. I plan to keep two does and two bucks in total, with the remainder being homed to our waiting list. If you are interested in going on the list for future litters, please see the Homing page for more information.